One of the best things about an online casino are the fantastic bonuses that you can take advantage of, but before you do accept any online casino just make sure that you read through the terms & conditions first. The casino bonus T’s & C’s will tell you everything you need to know about the bonus and this will avoid any confusion later on. For example, most online casino bonus have wagering requirements attached to them. Wagering requirements are also often referred to as playthrough requirements. Both terms mean exactly the same thing and it is usually something that you cannot get out of when claiming a bonus. The wagering requirement is the amount that you generally have to wager before you can withdraw any winnings. Most online casino bonus wagering requirements can range from as little as 20x the bonus amount up to usually no more than 60x times the bonus amount. The lower this value is, the better it is for you and the quicker you will be able to get your hands on your bonus cash. Let’s take a quick look at how this works. If, for example, you have just accepted a 100% matching deposit bonus worth up to $/€/£1000 (or equivalent currency) and you deposited just $/€/£50, you would instantly receive a total of $/€/£100 as soon as you have made your deposit ($/€/£50 deposit + $/€/£50 bonus cash). With a 50x wagering requirement, it means that you would be required to wager a total of $/€/£2,500 ($/€/$50 x 50 wagering requirement) before you could withdraw. Most online casinos will also require you to wager the deposit amount as well. In other words (using the same example above), you would have to wager a total of $/€/£2,550 before you could withdraw and not $/€/£2,500. If you do not complete these wagering requirements with a certain amount of time, you could lose your bonus cash. 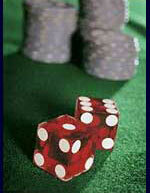 Most casinos will give you either one week or one month to complete your wagering requirements. If you find that it’s taking too long, you can always forfeit your bonus cash at any time, which means that you won’t have to keep trying to complete your wagering requirements. If you did this, the bonus cash would disappear and you would simply be left with your initial deposit instead of having any bonus cash to play with. Remember that you don’t always have to accept a bonus, but they can sometimes be extremely rewarding. All of our featured online casinos are currently offering some great casino bonuses for both new & existing players and these bonuses all have fairly realistic wagering requirements attached to them. It is very rare to find an online casino bonus which has zero wagering requirements, but these ‘zero wagering requirement bonuses’ do exist so consider yourself extremely lucky if you do find one and take full advantage of it.